Important – this is a legal agreement between The Commercial Kitchen Limited, the publishers of Family Business United, and you. By using this website you agree to this agreement whether or not you have read it. If you do not agree to this, you may not access or otherwise use this Website. From time to time, The Commercial Kitchen Limited may modify this agreement. Accordingly, please continue to review this agreement whenever accessing or using the Website. If at any time you do not wish to accept this agreement, you may not use the Website. The Commercial Kitchen either owns or is licensed to use the copyright of the data appearing on the Family Business United website unless another copyright holder is credited on the relevant page of the website. We appreciate that our material may help to back-up your own research or to augment the promotional activities of your company. - publish a credit to Family Business United or to a specific and to any individual named author, at the foot of the re-used material; and, if reproduced on a website, include a URL link to the original article or the point of entry to that website page. If you are unsure of the legality of your re-use of material published on the Family Business United website please contact us prior to use. The following responsibilities are attributed to any users of the Family Business United website. You may not transmit any unlawful, threatening, abusive, libellous, defamatory, obscene, pornographic, profane or otherwise objectionable material or information of any kind including but not limited to transmission constituting or encouraging conduct which would constitute a criminal offence, give rise to civil liability or otherwise violate any national or international law. You may not transmit any information, software, email or attachment which contains in full or in part any Virus, Worm, Trojan Horse or other harmful component. 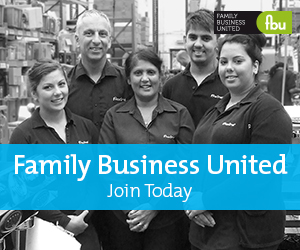 You may not restrict or inhibit use of Family Business United by any other individual or organisation. All individual articles, reports and other elements making up Family Business United may be copyright works or protected by database rights. You agree to abide by all additional copyright and database right notices or restrictions contained on the Website. Other than the licences granted to you under this agreement, you may not copy, reproduce, recompile, decompile, disassemble, reverse-engineer, distribute, publish, display, perform, modify, upload to create derivative works from, transmit, communicate or in any other way exploit any part of the Family Business United website. You agree to indemnify, defend and hold harmless The Commercial Kitchen Limted from and against any claims, actions, demands or other proceedings brought by a third party to the extent that such claim, suit, action or other proceedings is based on or arises in connection with your use of the Family Business United website and any breach by you of this agreement. This section survives termination of this agreement for any such reason. The Family Business United website may include links to third party websites but this can in no way be taken as The Commercial Kitchen Limited or Family Business United endorsing the content of these sites. As such, The Commercial Kitchen Limited accepts no responsibility or liabilities for any losses or penalties that may be incurred or for the accuracy of hyperlinks to third party web sites, or the content of such third party websites, or reliance on information contained in these sites upon which a decision is based. The Commercial Kitchen Limited does not accept any liability for any loss of data or software, revenue, business, profits cost or expense, or any direct, indirect, incidental or consequential loss or damage arising out of or in connection with the use of, or the lack of availability of the website or their content and/or in connection with any permission, right or licence to use the material given or otherwise. It is your responsibility to assess the value of the information and material on Family Business United in the light of your own business and personal circumstances, and advice from your own professional advisers. Website content remains journalistic opinion and does not constitute legal, financial or professional advice, and may not represent the views of The Commercial Kitchen Limited, its directors, employees or agents.